A 16-year-old boy presented with breathlessness and palpitations on minimal exertion for the past 1 month. He had no fever, respiratory symptoms or chest pain. He was a nonsmoker, nonhypertensive and nondiabetic. There was a family history of hypercholesterolemia in the younger sister. She was asymptomatic and was already on statin therapy. His younger brother died suddenly a year earlier. His parents were asymptomatic and their physical examination was normal. Unfortunately, we do not have their lipid profile. The patient's physical examination revealed tendinous and tuberous xanthomas [Figure 3] and [Figure 4], stria palmaris and arcus juveniles. Cardiovascular examination revealed mild cardiomegaly. 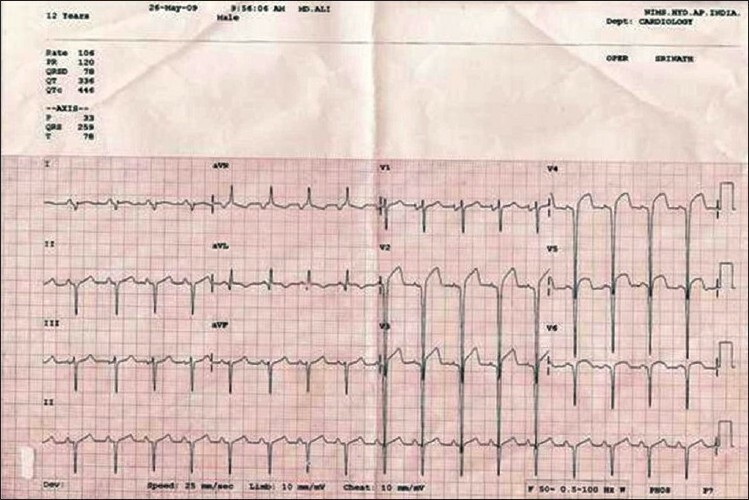 The electrocardiogram showed poor progression of R' wave in lead V1 to V4. 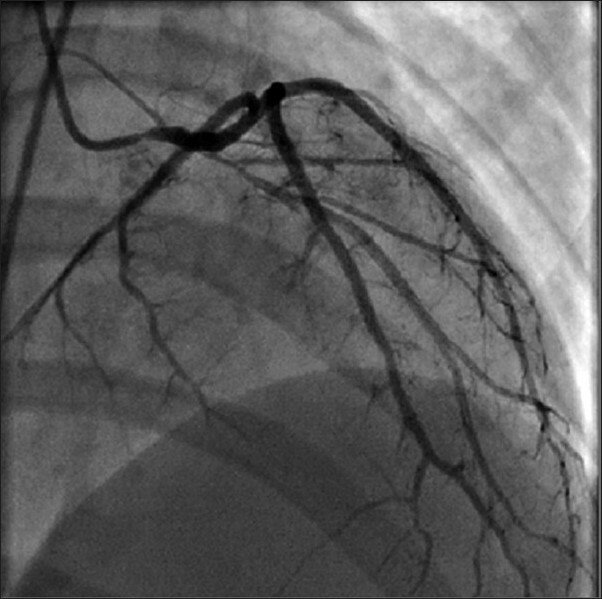 The chest x-ray showed cardiomegaly and there was evidence of pulmonary venous hypertension. The 2-D echocardiogram showed dilated LV, with severe LV systolic dysfunction and akinetic interventricular septum, moderate mitral regurgitation and moderate pulmonary artery hypertension. His lipid profile was as follows: total cholesterol, 440 mg/dl, LDL cholesterol, 398 mg/dl, HDL cholesterol, 30 mg/dl, TG, 60 mg/dl and VLDL cholesterol, 12 mg/dl. He underwent coronary artery bypass grafting (CABG) on the next day uneventfully and he was discharged after 2 weeks on the following drugs: diuretics, ACE inhibitors, beta-blockers, anti-platelets (aspirin and clopidogrel) and statins (rosuvastatin and fenofibrate). He was asymptomatic during the 1 st month follow-up visit. Our first case suggests nephrotic syndrome as a possible cause of thrombotic occlusion of the coronary and cerebral arteries, causing MI and cerebrovascular accident in this child. Ischemic heart disease is a rare complication of nephrotic syndrome. Only few cases are reported worldwide. Silva et al. 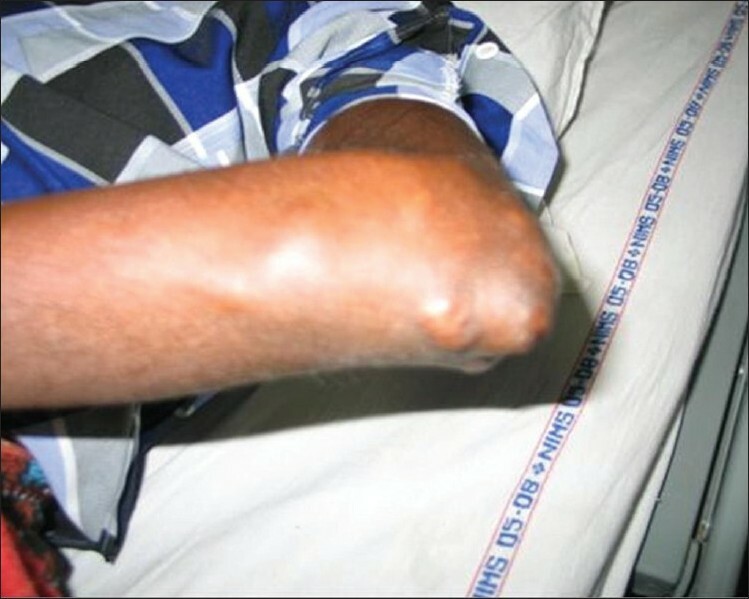 reported a 7-year-old boy with a 4-year history of steroid-unresponsive nephrotic syndrome due to mesangial proliferation disease and he presented with anteroseptal MI. However, cardiac catheterization showed no evidence of atherosclerotic coronary artery disease. Thrombotic occlusion of the left anterior descending artery was the likely cause of the event, similar to our patient. Hopp et al. reported a 7-year-old boy with a 5-year history of steroid-unresponsive nephrotic syndrome due to minimal change disease presenting with acute MI. MI in children with angiographically "normal" coronary arteries could occur because of hypercoagulable states - nephrotic syndrome and antiphospholipid syndrome (Hughes' syndrome), ,,, coronary artery spasm, , coronary embolization  and myocardial bridging. There are no controlled trials to guide early treatment of MI in this age group. In conclusion, MI in children may result from diverse causes requiring different management approaches. 1. Silva JM, Oliveira EA, Marino VS, Oliveira JS, Torres RM, Ribeiro AL, et al. Premature acute myocardial infarction in a child with nephrotic syndrome. Pediatr Nephrol 2002;17:169-72. 2. Hopp L, Gilboa N, Kurland G, Weichler N, Orchard TJ. Acute myocardial infarction in a young boy with nephrotic syndrome: A case report and review of literature. Pediatr Nephrol 1994; 8:290-4. 3. Fujimura O, Gulamhusein S. Acute myocardial infarction: Thrombotic complications of nephrotic syndrome. Can J Cardiol 1987;3:267-9. 4. Hamsten A, Norberg R, Bjorkholm M, de Faire U, Holm G. Antibodies to cardiolipin in young survivors of myocardial infarction: an association with recurrent cardio-vascular events. Lancet 1986; 1:113-6. 5. Manzar KJ, Padder FA, Conrad AR, Freeman I, Jonas EA. Acute myocardial infarction with normal coronary artery: A case report and review of literature. Am J Med Sci 1997;314:342-5. 6. 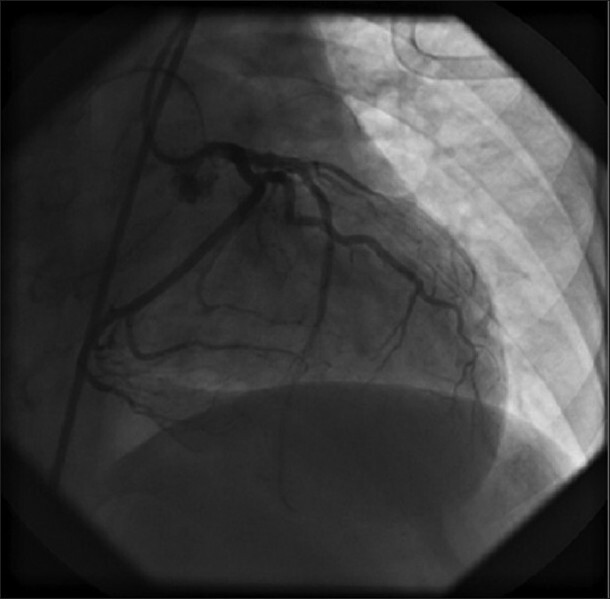 Penny WJ, Colvin BT, Brooks N. Myocardial infarction with normal coronary arteries and factor XII deficiency. Br Heart J 1985;53:230-4. 7. Simpsons RW, Edwards WD. Pathogenesis of cocaine induced ischemic heart disease-autopsy findings in a 21-year old man. Arch Pathol Lab Med 1986;110:479-84. 9. Agirbasli MA, Hansen DE, Byrd BF. Resolution of vegetations with anticoagulation after myocardial infarction in primary antiphospholipid syndrome. J Am Soc Echocardiogr 1997;10:877-80. 10. Osula S, Bell GM, Hornung RS. Acute myocardial infarction in young adults: Cause and management. Postgrad Med J 2002;78:27-30.